Not many of us remember I Mate, which was a company which used to make Windows Mobile devices. It was one of the many original equipment manufacturers (OEMs) that once lived. But then, it went out of business due to many reasons. But now, the Seattle Times reports that the company may come out with a new product that is going to change the way we look at technology. This is because the device is expected to pack a lot of power in a small size, and we mean a serious amount of power in a seriously small package. The company is building a new device which will have a 4.7 inch touch screen and the hardware of a computer. Instead of running the mobile version of Microsoft’s latest operating system, which is the Windows Phone 8, the company will be running the full Windows 8 Pro, which is a desktop version. And then, instead of having a smart phone processor, the device will have a third generation Intel processor, the Clover Trail Intel Atom to be more precise. This new product will called the Intelegent and will come with 2 GB of RAM and 64 GB of internal memory. A microSD card slot for expanding the memory may be expected. Also, there will be HSPA+ and 4G LTE network support on the device. The battery is said to be big enough to give 10 hours of talk time. According to rumors, the device will come with a price tag of $750. 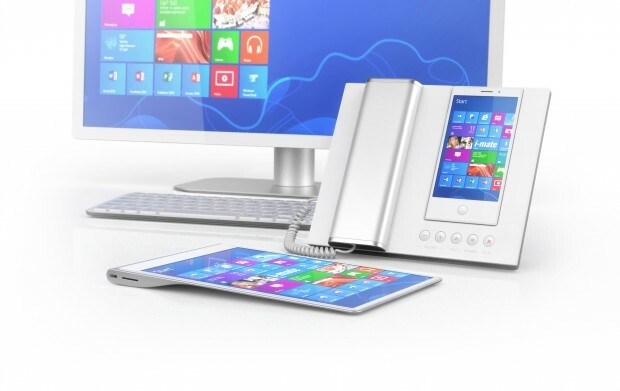 I-mate will sell the phone alone or as part of a $1,600 desktop hardware suite including a docking station, called the “hub.” Docked in the hub, the phone can be used with a traditional, wired phone handset or make video calls. It also functions as a desktop PC — powering a 23-inch touch-screen display, keyboard and mouse — and drives an auxiliary wireless tablet with a 10.1-inch, 1080p display.